Duggar Family Blog: Duggar Updates | Duggar Pictures | Jim Bob and Michelle | Counting On | 19 Kids: Getting Ready for Baby Dilly! Getting Ready for Baby Dilly! Jill Dillard is 17 weeks pregnant, and she and Derick are looking forward to their March 24th due date. 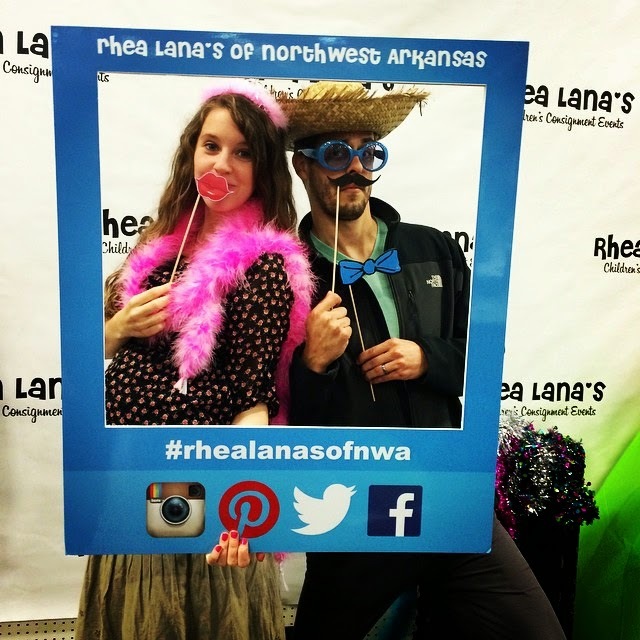 The parents-to-be visited the Fayetteville Rhea Lana's, a semiannual consignment event that sells children's and maternity items, yesterday evening. Jill has visited Rhea Lana's with her mom and sisters in past years to shop for her siblings. Now, she and her hubby are buying clothing, toys, and furniture for their own family! Visit the blog on Tuesday for a big announcement from Jill and Derick. Click here to find out what other readers think the news will be and to share your thoughts. Excited for March. Glad their buying used instead of all new. Buying all new items costs more money than buying used. But I bet that they'll get some new items such as baby car seat and stroller and a crib and a playpen since you shouldn't buy those used very often since you don't know how long they'll last and if their broken or not. Maybe slightly used, but not used every two or three kids people have before getting rid of it since it could be worn or something. Love everything about your family! Now watching the young adults get married and start families of their own makes me smile! Thank you for the awesome examples you set for the world to see! How cute is that! I'm due w/our 7th on March 28. Baby is measuring early, though, so maybe our baby and Jill and Derick's will share a birthday. She is huge for 17 weeks! I never showed before 20. At 26 weeks I was still in normal clothes with my 1st and never wore maternity with my 2nd. Anna or her Mom. and I think it is way too soon to be buying anything for the baby just yet? It's too early to buy stuff. And they should not buy anything until after the showe. Is she carrying twins? Like a boy and a girl? Just guessing. Can you just post a photo of the belly ! Yeah I don't think it's twins either because twins generally skip a generation. Every woman carries differently and some show more than others. What a great way to find bargain's for the new addition(s). I am sure the nursery will be very nice once complete. Happy for them. What ever boy or girl they will be happy. I just wish we weren't so far behind with your life story on tv. We haven't seen your wedding video yet and now Jessa is getting married soon and your baby is progressing nicely and we are out of touch and left so far behind. I wish your videos were more current. Not current enough? Where i live Marcus isn't even been blrn on the show yet! Im sooooo excited that Jill and Derrick are having a baby soon! I cant wait to see what gender it is! May God continue to bless you,Jill and Derrick! That's cool. Could we get more pictures if you have any please? I think she will be having twins and they both will be girls. My guess: Michelle, Derick, Ben, Jessa, and Grandma Duggar are going to be on Dancing With The Stars; flip flops and all. Oh WOW! Look at how big Jill has gotten. I see twins in their future. They are such a cute couple. They were made for each other. I thought it would be a gender reveal, but since Jill's belly is this big at just over 4 months, I am now guessing that they are having twins. Twins! Too early to be gender reveal and her belly is too big! I think that Jill is definitely having twins based on big she looks in the picture. I think that they are a boy and a girl. Does anyone know yet when the wedding will air on TV? As an OB nurse I'm just about positive Jill is having twins! A first time mom doesn't usually show at all until around 16 weeks and she's been showing a long time IMO! Either way it's a very blessed event. Much happiness to everyone! I love your family ..all of you are so blessed .congrats on your pregnancy Jill!! I'm so happy for you and your husband. Love Rhea Lana and the Just Between Friends sales! I am super excited for her and well i know that every person and prefnancy are different on baby size, I would be surprised with her NOT being pregnant with twins. For only being 17 weeks she looks at least a month to two month further ahead in pregnancy. I am 17 weeks myself with my fourth pregnancy and she looks bigger with her pregnancy at 17 weeks than I do with mine. It would explain why she got SUCH morning sickness if it was twins. It does run in her family as her mom has had at least one set of fraternal twins (not sure what the younger boys are). i wonder if jana will be jill's doula? also, didn't jessa mention being interested in midwifery too? It does say that this is a semiannual event. So, I guess they had to go because they'll have a baby when the next event comes along. Will the wedding of Jessa and Ben be on TV at Nov. 2nd or when will it air? @Anonymous I am not a nurse, but I know the size of the tummy has nothing to do with the size of the baby, and it does not mean multiples. I started showing at 10 weeks, and I had a 7'9 baby boy, I was small, not overweight. Can triplets come naturally, by the way, without any fertility drugs? Yes, they can, but very rare. How exciting would it be, though, if it were?! I wish there were more posts about Jessa's wedding. Jill is nowhere near her due date and The Seewald wedding is less than 2 weeks away. Can you please post a video tour of Jill and Derick's home. Also, can you post some recent pictures of Jill's baby bump? I have worked in an OBGYN office for 25 yrs.Not all women show the same, size does not matter! Some women do show very early and by the time the third trimester comes around things even out.Ive seen it all, and all this speculating is just plain ridiculous. @Anonymous@anon 36: yes, triplets can be conceived naturally.but it's pretty rare. I have a friend who had 6 children and was trying for a seventh. They had just bought a van to hold seven children too. And that was to be their last child. She became pregnant and when they went to the ultrasound triplets were detected. It was a complete shock. No drugs involved at all. They had to buy a bigger van and extend their house. So yes, it is possible but pretty rare. I'm hoping its twins, but some people seem to show easily. For varying reasons. So it may only be one. Whatever baby Dilly is, I hope it's healthy! Seriously, it is like Jill/Derick are everywhere and just about every post. Is that because they are constantly sending info to this blog or is this blog focusing only on them. There is like hardly anything on Ben and Jessa and they have a bigger event going on then having a baby. Jill/Derick were on the blog continuously during their engagement time too? What is up with that? Just wondering. Is it possible to see more tummy pics of Jill in front of that door? Congratulations to the lovely young couple! It is never too early along in a pregnancy to get excited for baby and get everything ready! :) God bless and may the rest of the pregnancy and delivery be safe and easy for Mummy!! They can afford new. Let the less fortunate have a chance at the sale items. Did Zach & Whit Bates have their baby boy? Congrats to Jill and Derick, they're having a boy! Wonder if they'll pass Derick's father's name to their son? I just read that it's a boy. awesome! my b-day is March 26!!!!! Jessa Duggar: "I Might Have More than 19 Kids"
How Well do the Dillards Know Each Other? Jill Dillard: "We are Thrilled"
Recap: "Duggars in Cuffs" & "Duggar Derby"
Peachy Salmon, Potato Mashups, and More! Win a Candle Warmer...Just in Time for Fall!